Today I had lunch with several of my painting friends. It was such fun to talk with people who all love art-we inspired one another to keep working! I've kept my promise to myself to paint en plein air once a week. This is part of my effort to LOOSEN UP! A common goal, it seems. I'll post some of my efforts in the future. 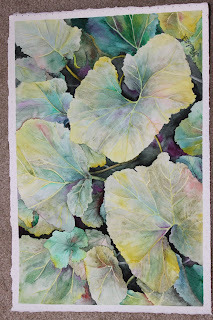 Meanwhile, the squash plants in my garden are so exuberant and beautiful that I wanted to paint them. I began by taking a bunch of photos and thinking about how to approach the project. I also experimented with Winsor & Newton's Blending Medium. It helped me keep the leading edges wet so I could avoid hard lines where I didn't want them. I used a limited palette of 7 colors: Winsor green (yellow shade), terre verte (yellow shade), green gold, perylene green, turquoise, quin.magenta, and brown madder. After I thought it was finished, I put the painting up and looked at it for a day...went back and added more darks in the upper left quadrant, (which is shown at the lower left-for some reason, the picture rotated when it was loaded!?! )which really pulled it all together. I'm going to try another version soon. As always, I think your paintings are sooooo good. very nice, i love your use of color!